International conference on Computer Networks and Inventive Communication Technologies (ICCNCT - 2018) will provide an excellent international forum for sharing knowledge and results in theory, methodology and applications of Computer Networks & Data Communications. The Conference looks for significant contributions to the Computer Networks & Communications for wired and wireless networks in theoretical and practical aspects. Original papers are invited on Computer Networks, Network Protocols and Wireless Networks, Data Communication Technologies, and Network Security. 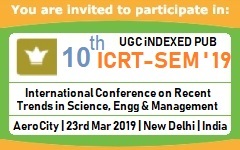 The aim of the conference is to provide a platform to the researchers and practitioners from both academia as well as industry to meet and share cutting-edge development in the field.